Recently the new platform of the company Lagerhäuser is available at www.lagerhaus.at. The unusual thing about this site is that it contains around 50 shops in a single online presence. What this means for the company and its customers and which challenges had to be overcome on the part of the client together with for​you​and​your​cu​sto​mers during the implementation, you can find out in our article. RWA Raiffeisen Ware Austria is the wholesale and service company of the Lagerhaus cooperatives in Austria. As part of its SMART digitisation offensive, the company, which is rich in tradition, is being made fit for the future by means of a wide variety of projects as it undergoes digital change. The joint work with foryouandyourcustomers started in 2016 and since then important milestones have been taken and implemented. The first step was to update and revise the product database on the basis of SAP Hybris. An area in which foryouandyourcustomers has many years of expertise due to the successful implementation of numerous projects. Also in 2016, the detailed conception for the Lagerhaus online platform began. Thanks to the cross-location cooperation, above all through the support of the foryouandyourcustomers location in Munich, the existing concept was revised in workshops, supplemented for desktop and mobile and then a clickable prototype of the new platform was created. At the same time, the system architecture was analysed in detail together with RWA and in cooperation with foryouandyourcustomers Amsterdam and a future-proof architecture was created. For the project “Web & Shop”, for which foryouandyourcustomers Vienna was awarded the contract, different software solutions were to be developed and linked. Another entity of SAP Hybris was used as e-commerce system, while content maintenance and product playout were handled via the BloomReach Digital Experience Platform and a frontend. The Digital Experience Platform (DXP) was a new technology for the foryouandyourcustomers development team. As the first and only BloomReach partner in Austria, it was possible to immediately build up know-how and implement a modern platform. Some employees of foryouandyourcustomers Vienna are now working exclusively with BloomReach DXP. The Lagerhaus company and its warehouses in Austria are organised in cooperatives. Each cooperative has its own locations and therefore also different products, prices and opening hours. In order to make all warehouses accessible online, it was therefore necessary to integrate around 50 shops on a single site. During the first visit, the user is now automatically assigned to the nearest warehouse or can freely choose his location. For this purpose, an extra service was developed in which opening hours and contact persons of the different locations are maintained. The information from the warehouses as well as the prices from SAP Hybris must be collected and displayed for the customer at a central location. BloomReach DXP thus serves as an interface for all systems and plays out the entire platform for visitors. 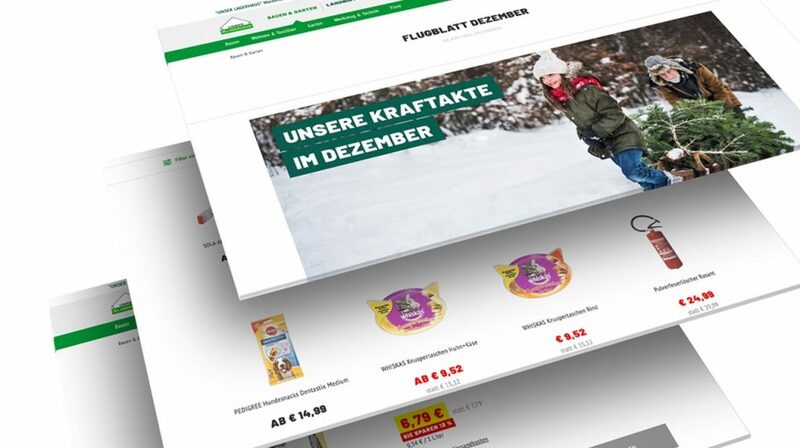 After an internal soft launch, where only employees of RWA, the Austrian Lagerhäuser and foryouandyourcustomers could shop and test the platform, the shop went online parallel to the previous Lagerhaus site. On 12 November 2018, the old site was deactivated and since then Web & Shop have been united and accessible to the general public. Whether on computer, tablet or smartphone: shopping in the warehouse now works around the clock and via any accessible channel. 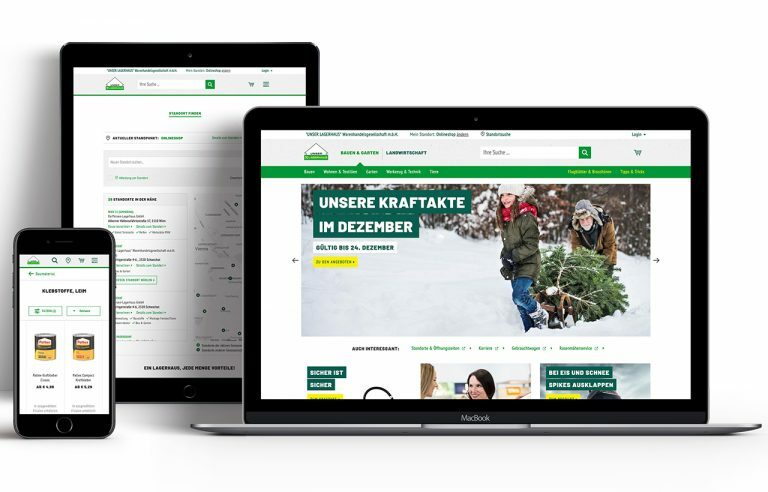 For Stephanie Reimann, CEO Lagerhaus e-Service GmbH, this was an important milestone in the company’s digitisation process: “The team of foryouandyourcustomers helped us to further advance our digitisation strategy and get the new platform including shop for the warehouses online. The cooperative structure of the Austrian warehouses is not always easy to map, but together we are on the right track. We are looking forward to the further developments in the shop and the continued good cooperation with foryouandyourcustomers,” because the warehouses have a lot in store for the future and there are numerous features planned for the platform. Topics such as the regionalisation of the site, so that the warehouse cooperatives can have regional content, are constantly being implemented by the team of foryouandyourcustomers Vienna led by Andreas Damberger and Manuel Hanel.